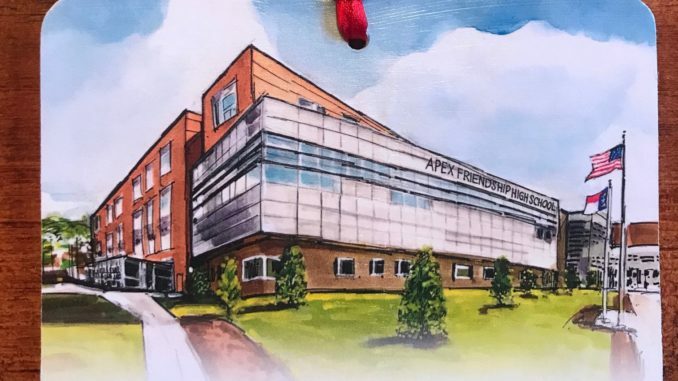 Local Apex artist Lewis Wilson has painted this beautiful rendition of our school. Like last year, he will be doing another fundraiser for our PTSA. With every print and/or ornament sold, Wilson Art will donate 20% back to our school! In addition to the Class and Year printed on the ornaments, they are now able to personalize with name and sport icon. Prints vary in size with the most popular sizes being 5×7 matted to 8×10 ($30) and 8×10 matted to 11×14 ($50). Ornaments with just Class of Year are $15. Personalized one are $18.